(Waldorf, Md., Sept. 23, 2017) - The York Revolution secured a berth in the Atlantic League Championship Series with a 5-1 victory over the Southern Maryland Blue Crabs in Game Four of the Freedom Division Championship Series on Saturday night in front of 3,479 fans at Regency Furniture Stadium. The Revs win the division title for the third time in franchise history and first since 2011, and will meet the Long Island Ducks with the best-of-five Atlantic League Championship Series beginning in Central Islip, NY on Wednesday evening before shifting to York on Friday. The Blue Crabs struck first on a two-out RBI single to left by Devon Rodriguez for a 1-0 lead in the first inning, plating a first inning run for the third consecutive game. York answered right away in the second. Luis Cruz led off the inning with a double down the left field line and moved to third on a Travis Witherspoon groundout. With two outs, Chase Simpson lined a clutch RBI single to right-center, tying the game at 1-1. The Revs were denied of a bases loaded opportunity in the third as Crabs starter Drew Hayes rolled an inning-ending double play, and missed an opportunity in the fourth as Witherspoon led off with a double but was picked off at second base. York did cash in with three runs in the fifth, taking control of the game. Jared Mitchell led off with a single to right field. Rubi Silva was denied on a deep drive to center field as Corey Vaughn crashed into the fence and held on for the first out, but with one away, Mitchell stole second and took third on a throwing error by catcher Luis Alen, setting him up to score on a wild pitch on a strikeout of Telvin Nash to give York a 2-1 lead. Nash reached first on the play, and Michael Burgess slammed a two-run homer to right, increasing the lead to 4-1. Revs starter Logan Williamson was outstanding in earning the win, and did not allow a hit after the first. The lefty surrendered just one run on two hits in five innings, before turning it over to the bullpen. Joe Van Meter, Grant Sides, and Ricardo Gomez all worked scoreless innings to push the game to the ninth. York added an insurance run in the ninth as Silva led off with a double off the left field fence, and scored as Burgess drilled a one-out RBI double to right, providing the final margin. 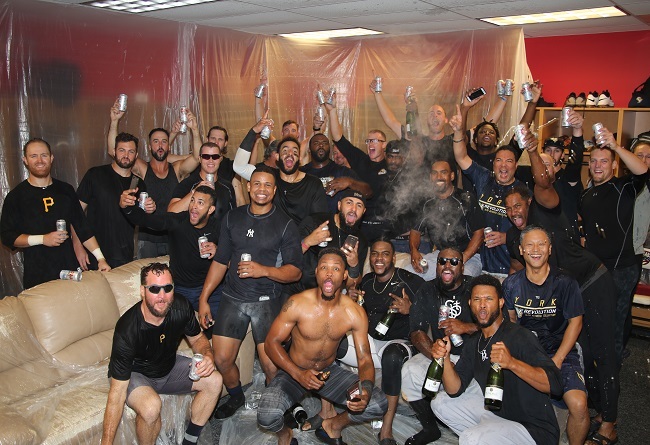 Chase Huchingson allowed a leadoff single in the bottom of the ninth, but retired Vaughn on a double play and Edwin Garcia on a groundout to short, securing the Revs’ third division title in franchise history. The Championship Series matchup is a rematch of the 2011 series, won by York three games to one. Game One is set for Wednesday night at Long Island with first pitch at 6:35 p.m. Revs fans can catch the action live on SportsRadio 1350, woyk1350.com, and on the WOYK app beginning at 6:15 p.m. with Darrell Henry on the call.